Congenital hydronephrosis caused by pelviureteric junction (PUJ) obstruction is a common pediatric congenital urinary malformation detrimental to child's health with frequency of 1/1000–2000 newborns. Quite a few studies have shown that PUJ obstruction results from the abnormality of the ureteral smooth muscle at the junction  and abnormal neural innervations. In the upper urinary tract, peristaltic contractions serve to propel urine from the renal pelvis to the ureter. The knowledge of histological changes and innervations at PUJ and upper ureter is required for proper understanding of pathophysiology and its correlation with the functional outcome after pyeloplasty. This study is undertaken to study the histopathological changes and density of neuronal innervations of PUJ in patients with PUJ obstruction (PUJO). This is a prospective study of twenty patients with hydronephrosis due to PUJO undergoing surgical treatment from 2013 to 2015 in pediatric surgery unit. The age of patients varied from 7 months to 9 years. The preoperative evaluation was composed of ultrasonography, Technetium-99m diethylenetriamine pentaacetic acid scan, intravenous pyelography, and routine biochemical measurements. Seven PUJ complexes were taken as control, two from patients who had roadside trauma and underwent nephrectomy, and five who did not show any clinical or laboratory symptoms of PUJO and underwent nephrectomy because of Wilms tumor. Patients who have extrinsic PUJO, secondary to an injury, distortion as a result of previous surgery, inflammatory process, urolithiasis, and vesicoureteral reflux were excluded from the study. A PUJ sample no. smaller than 6–7 mm was taken each time. For both control and patients with obstruction, PUJ was excised with the resection margin of 3–4 mm above and below the PUJ. Surgical specimens of PUJ complex of twenty patients who underwent Anderson-Hynes pyeloplasty were studied. The specimens were formalin fixed. Each fixed tissue specimen was dehydrated in graded alcohol and then processed by standard tissue processing protocol. The tissues were embedded in paraffin and 5 μ thick paraffin sections were cut. Three tissue blocks were taken from PUJ area and fourth will be taken from the lower end of the excised ureter. 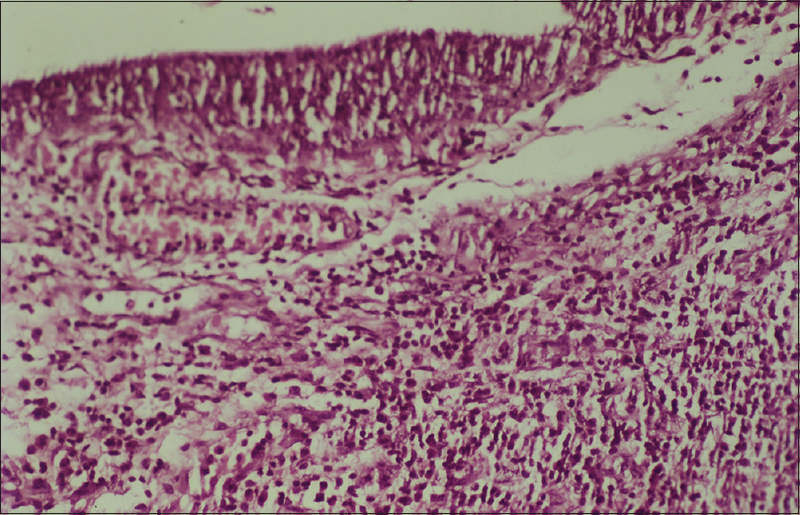 Sections were strained with hematoxylin and eosin stain, elastic von Gieson stain for muscles, fibrous tissue, and elastic tissue. 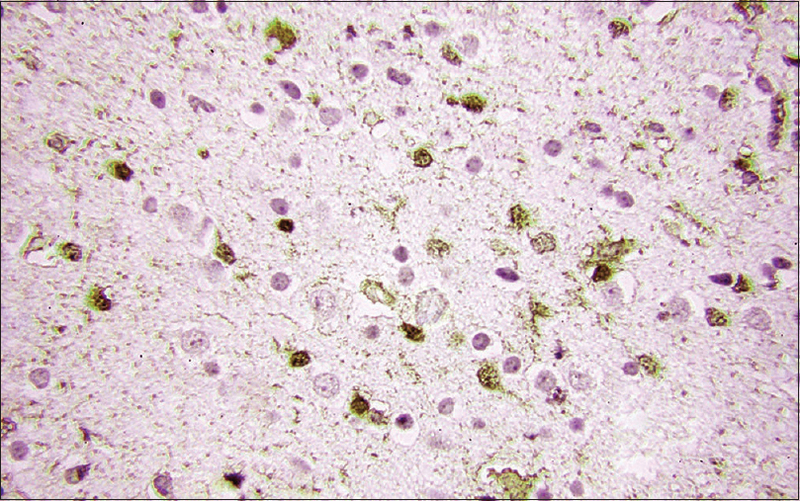 For immunohistochemistry, the tissue sections were immune stained by an indirect immunoperoxidase method for S-100 and neuron-specific enolase (NSE). The indirect immunoperoxidase method involves coating the section with murine monoclonal or rabbit polyclonal antibody for 1 h, followed by a phosphate-buffered solution (PBS) wash, 5 min for three times. The sections were subsequently coated with antimouse or rabbit peroxidase-conjugated secondary antibody. After PBS wash, color reaction was developed by diaminobenzidine. All measurements were made directly on the histologic sections by the use of Leitz eyepiece micrometer. The ocular grating was calibrated with a scaled microslide. Each 100 divisions were equivalent to 850 μ, when viewed by ×20 objective lens. Musculature consisted of bundles oriented in various directions and woven into a dense network. No separate discrete layers of fibers disposed circularly or longitudinally. The muscle fascicles were thin and sparse. The sphincter structure was not demonstrated at the PUJ. There was no fibrous tissue in the muscle layer [Figure 1]. 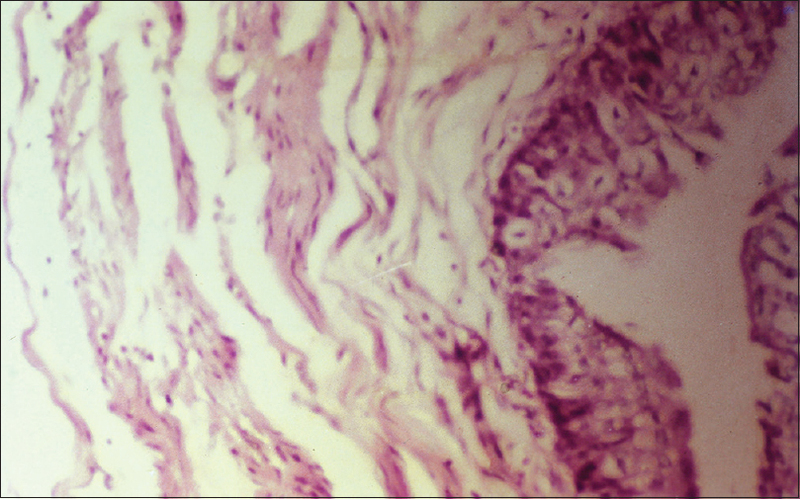 The thickness of submucosa varied from 165 to 211 μ with a mean of 188 μ. The muscle layer was fairly thin and thickness ranged from 87 to 126 μ, with a mean of 106.5 μ. The nerve fibers were sparsely observed in lamina propria, muscle coat, and adventitia. The epithelial lining was thinned out, with ulcerations in two cases. 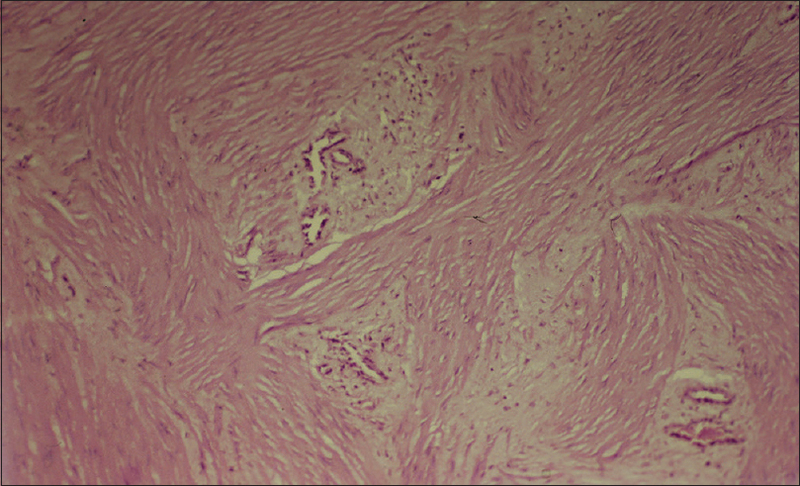 Inflammatory cells infiltrated into the submucosal layer, and extension into the muscle layer was seen in three cases [Figure 2]. In 14 patients, the arrangement of muscles was compact and layered, i.e., thick layer of circular muscle surrounded by a layer of longitudinal muscle one inside and others outside the circular layer [Figure 3]. In six patients, the muscular arrangement was in criss-cross and tangential [Figure 4]. 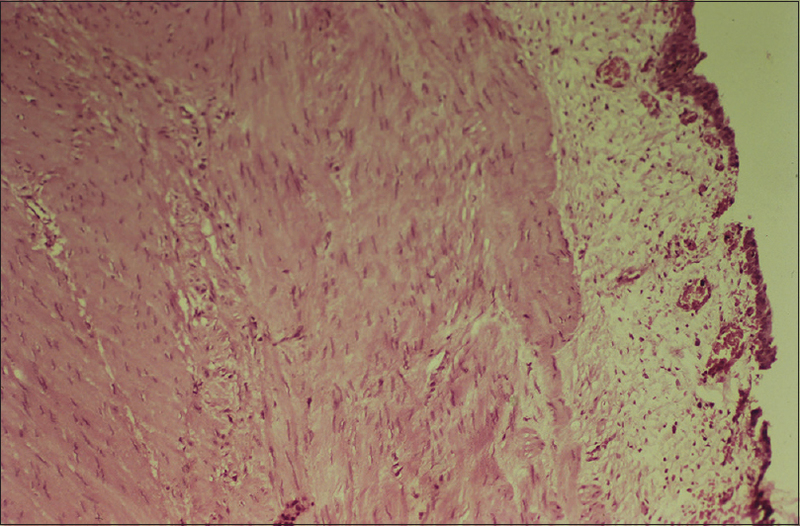 The fibrous tissue was noticeably increased in the submucosa and muscle layer in 17 patients. The nerves stained by S-100 and NSE were found to increase in 14 cases. The larger nerve bundles were mainly located in the adventitia and small nerve twigs consisting of single or few nerve fibers were observed in the muscular layer [Figure 5]. The width of submucosa was considered to be increased, ranged from 81 to 671 μ mean being 236 μ. The muscle layer was hypertrophied and was increasing in thickness. The width ranged from 219 to 1014 μ, mean being 549 μ. In our study, the normal PUJ complex was not readily distinguished as a junctional region between the renal pelvis and the ureter. There was also no sphincter arrangement. This was in accordance with the study of Schneider and Caraudo. The muscle fibers were grouped into bundles that criss-crossed in all direction and communicated with one another leading to difficulty in distinguishing separate layers of circular and longitudinal muscle, and a similar view was expressed by Droff and Woodburne. This cris-cross arrangement of muscle fibers allows the ureter to contract not only circularly but also at the same time in a longitudinal direction. This is the pattern of peristalsis as experimentally illustrated by Whitaker. In this series, the thickness of the muscle layer was thin and ranged from 87 to 126 μ which is low in comparison to the thickness of 750–800 μ and 456–1001 μ as indicated in the literature. In this series, the nerve fibers were observed in all layers including lamina propria, muscle coat, and adventitia. This was also noted by Notley. In the present study, abnormal PUJ complexes showed a significant increase in thickness of submucosa, muscle layer, and collagen tissue in both submucosal and muscle layer. This is similar to the view of other authors.,, Increased collagen between muscles' bundles at the PUJ could contribute to the inelasticity in the region. This could prevent distension of PUJ by urine, resulting in dilatation of the pelvis. The increased collagen fibers in the muscle layer resulted in a more compact and rigid pelvis, thus restricting mobility and resilience of PUJ. This may also cause arrest in the variability and contractility of the smooth muscle cell. Even an increased collagen content in between the muscle bundles causes widening of nerve-to-cell and cell-to-cell distances. The presence of fibrotic segment at UPJ can block the downward transmission of peristalsis. In our study, the predominant arrangement of muscle fibers was layered, i.e., the presence of the circular layer in between two layers of longitudinal muscle. The peristalsis of the ureter requires a musculature integrated for it. If the ureteral musculature had a longitudinal pattern, then the result would be an asymmetric shortening of ureter with an impediment to transport of urine due to lack of forces to contract the ureter and thus for conduction of peristalsis. Inversely, in a ureter with a dominant circular muscle, active transport would also be hampered due to underdeveloped peristalsis or sphincter-like action. The formation of two longitudinal layers is a method to compensate for the obstruction, as a contraction of the longitudinal muscle bundles would tend to enhance the lumen of that segment and reduce the detrimental effect of the sphincteric structure. Tainio et al. found dense innervation of neuropeptide Y and S-100 nerves in the intrinsic obstruction as compared to normal and proposed that the dense innervation makes the junctions segment unable to relax, thus bringing about a functional disturbance. Murakumo Masashi et al. (1997) found abundant nerves in both submucosal and muscular layers in the normal PUJ complex, but in intrinsic UPJ obstruction, they found diminution of nerves in the muscular layer. Solari et al. found increased c-Kit-positive interstitial cells of Cajal (ICCs) between the muscle bundles in normal UPJ specimens, whereas the density of ICCs was markedly decreased in the muscle layers of PUJ obstructed specimens. They proposed that the neural depletion causes immotility of the muscular layer and could be a main cause of the intrinsic PUJO. ICCs have been contemplated generally, concentrating on the potential part of these cells in pathogenesis of intrinsic hydronephrosis. It is noted that human PUJ contains Cajal cells indistinguishable to those found in the gastrointestinal tract. These are shaft-molded cells with restricted cytoplasm, substantial core, and two cytoplasmic processes. Confinement of ICCs is, for the most part, confined to the muscle layer, and particularly, to the whole shape of the roundabout circular muscle layer. Patients with PUJO show not very much if any of ICCs, in spite of the fact that reports distributed on this matter are exceptionally dubious. As per Apoznanski et al., a number of ICCs were not statistically different analyzing graded age groups of pediatric PUJ, though Koleda et al. demonstrated that various Cajal cells in hydronephrotic patients are higher than that of normal participants. Furthermore, these creators discovered abatement in Cajal cells alongside maturing, though the expansion is clarified by an underlying compensatory component that stops at the time. In the present study, using immune histochemical techniques, nerves containing immunoreactivity to S-100, and neuronal-specific enolase was demonstrated in the normal and abnormal PUJ complexes. The innervations of the PUJ with the intrinsic type of obstruction were much more abundant than normal. This dense innervation may make the junctional segment unable to relax, thus bringing about a functional disturbance. On the basis of the present findings, it can be proposed that dense neuropeptidergic innervations might have an important role in the pathophysiology of the intrinsic obstruction, evoking a continual contraction and thus inducing the distention. There is no significant relationship between the severity of histological changes and the patient age, affected side, and duration of the presentation. Additional research is necessary to understand the path physiology of congenital PUJO. In the PUJ of PUJO patients, histopathologically, the predominant arrangement of muscle fibers was layered, i.e., a thick circular layer surrounded by two longitudinal layers on either side. The immunohistochemical study showed dense neural innervation in PUJ complex which might be responsible for causing intrinsic obstruction. There is not any correlation between the histological changes and the patient age, side affected, and duration of presentation. Jenkins D, Caubit X, Dimovski A, Matevska N, Lye CM, Cabuk F, et al. Analysis of TSHZ2 and TSHZ3 genes in congenital pelvi-ureteric junction obstruction. Nephrol Dial Transplant 2010;25:54-60. Leeson TS, Leeson CR. Histology. 2nd ed. Philadelphia: W.B. Saunders; 1970. p. 385-7. Ham AW. Histology. 7th ed. Philadelphia: Lippincott Co.; 1974. p. 775-6. Hanna MK, Jeffs RD, Sturgess JM, Barkin M. Ureteral structure and ultrastructure. Part I. The normal human ureter. J Urol 1976;116:718-24. Gosling JA, Dixon JS. Functional obstruction of the ureter and renal pelvis. A histological and electron microscopic study. Br J Urol 1978;50:145-52. Krakos M, Andrzejewska E. Abnormalities of ureteral innervations as the base of etiopathogenesis of congenital hydronephrosis in children. Przegl Pediatr 2004;34:94-7. Wang Y, Puri P, Hassan J, Miyakita H, Reen DJ. Abnormal innervation and altered nerve growth factor messenger ribonucleic acid expression in ureteropelvic junction obstruction. J Urol 1995;154:679-83. Gosling JA. The musculature of the upper urinary tract. Acta Anat (Basel) 1970;75:408-22. Whitaker RH. Some observations and theories on the wide ureter and hydronephrosis. Br J Urol 1975;47:377-85. Notley RG. The structural basis for normal and abnormal ureteric motility. The innervation and musculature of the human ureter. Ann R Coll Surg Engl 1971;49:250-67. Kench P. A morphometric study of the peliviureteric junction and review of the pathogenesis of upper ureteric obstruction. Pathology 1982;14:309. Gee FW, Kiviat MD. Ureteral response to partial obstruction – Smooth muscle hyperplasia and connective tissue proliferation. Invest Urol 1975;12:309. Starr NT, Maizels M, Chou P, Brannigan R, Shapiro E. Microanatomy and morphometry of the hydronephrotic “obstructed” renal pelvis in asymptomatic infants. J Urol 1992;148:519-24. Cheng EY, Maizels M, Chou P, Hartanto V, Shapiro E. Response of the newborn ureteropelvic junction complex to induced and later reversed partial ureteral obstruction in the rabbit model. J Urol 1993;150:782-9. Murakumo M, Nonomura K, Yamashita T, Ushiki T, Abe K, Koyanagi T, et al. Structural changes of collagen components and diminution of nerves in congenital ureteropelvic junction obstruction. J Urol 1997;157:1963-8. Kaneto H, Orikasa SX, Chiba T. 3D muscular arrangement at ureteropelvic junction and its changes in congenital hydronephrosis. J Urol 1991;146:909. Murnaghan GF. The dynamics of the renal pelvis and ureter with reference to congenital hydronephrosis. Br J Urol 1958;30:321-9. Tainio H, Kylmälä T, Heikkinen A. Peptidergic innervation of the normal and obstructed human pyeloureteral junctions. Urol Int 1992;48:31-4. Solari V, Piotrowska AP, Puri P. Altered expression of interstitial cells of cajal in congenital ureteropelvic junction obstruction. J Urol 2003;170:2420-2. Vaalasti A, Linnoila I, Hervonen A. Immunohistochemical demonstration of VIP, [Met5]-and [Leu5]-enkephalin immunoreactive nerve fibres in the human prostate and seminal vesicles. Histochemistry 1980;66:89-98. Apoznanski W, Koleda P, Wozniak Z, Rusiecki L, Szydelko T, Kalka D, et al. The distribution of interstitial cells of cajal in congenital ureteropelvic junction obstruction. Int Urol Nephrol 2013;45:607-12.